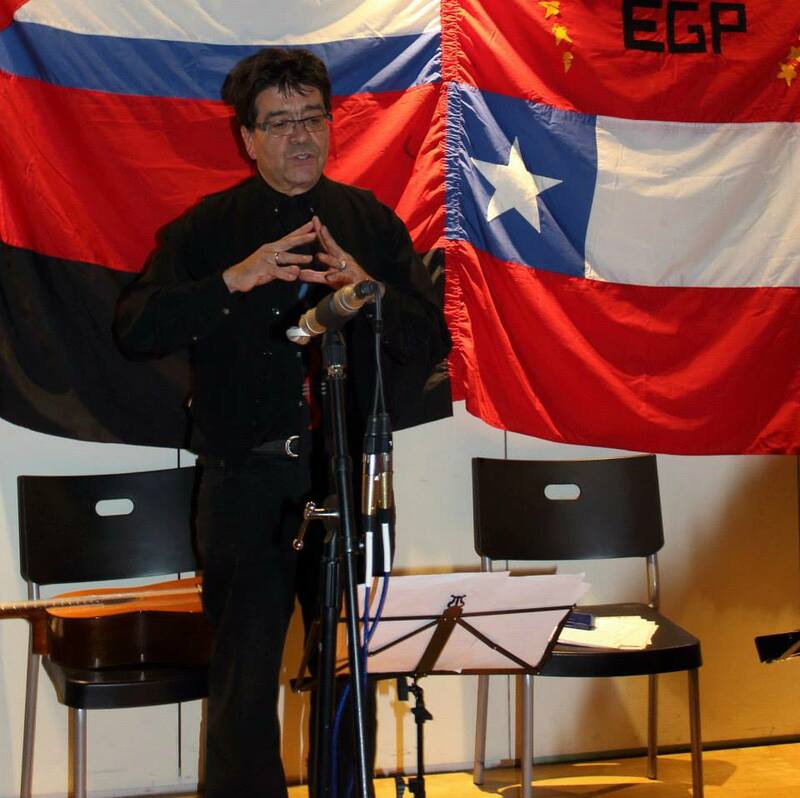 Below: donations of £400 given to FABULA by Miss Ada Pagan. Beside Galo. And given in the form of fishing equipment to fishermen from Tumbes : Juan Alarcon Pino, reg. pesquero artesanal N° 65817 and Mauricio Parra Estuardo reg. 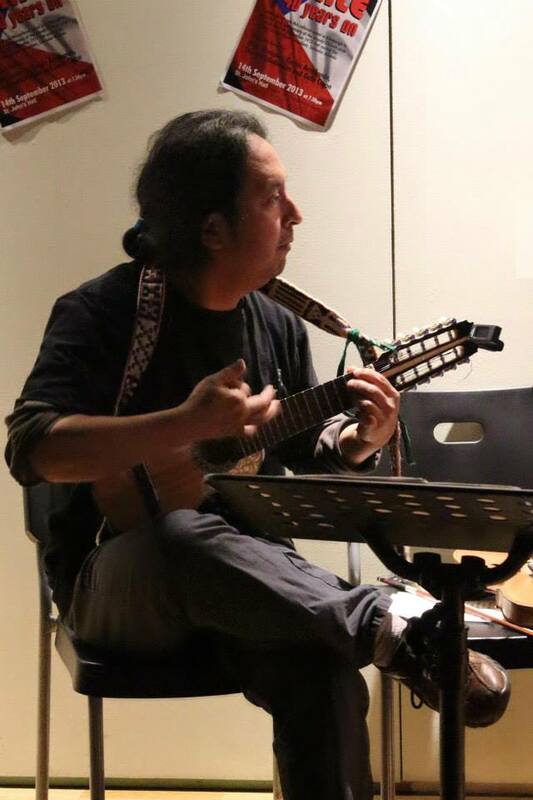 pesquero artesanal N° 80023. Below.Gael Garcia Bernal protagonist of Chilean film NO. On this basis I organised events under the name of “ Chile 40 Years On” to continue with my tradition of commemorating every 10 years the coup in Chile. It was a busy September as I was requested to do a series of activities related to the coup d’etat of forty years ago. In additions to the events mentioned below, there were several events in Edinburgh, Glasgow and Stirling. 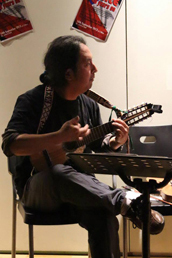 Most of the cultural activities have been carried out with the Chilean classical guitarist Galvarino Ceron Carrasco. Below, are testimonies of these activities which were very well attended. In the case of the concert of the 14th of September in Edinburgh, unfortunately, about forty to fifty people could not get into the hall as it had reach its full capacity. With Fiona and Iona, lecturers at Edinburgh University - Hispanic Studies-, managed to put on and for two weeks at Leith Library, ‘Jan’s Papers – Chile in 1973’. 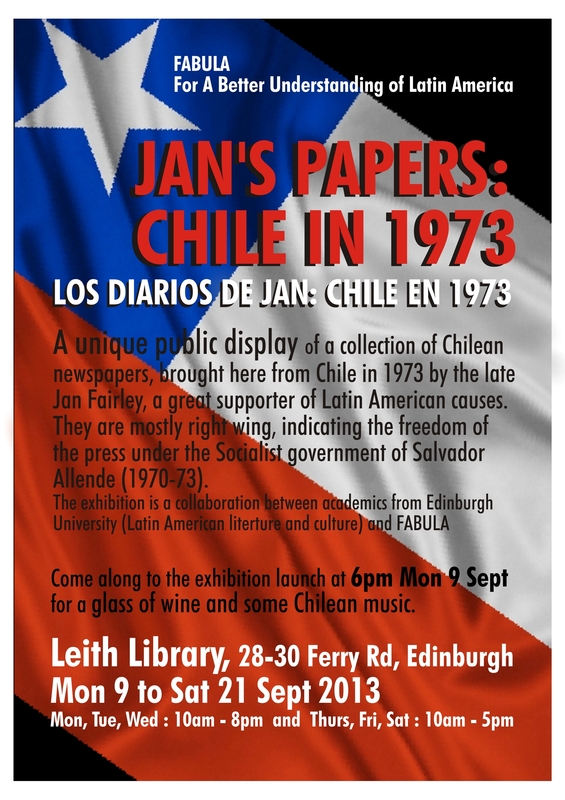 It was, an exhibition of Chilean newspapers from 1970s brought to Scotland by my friend the late Jan Fairley. 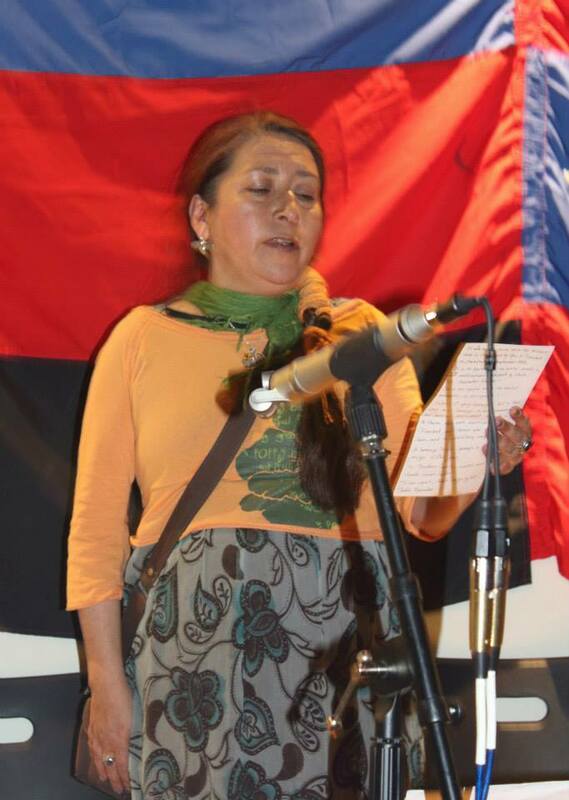 We were invited to Stirling to take part in a private reception given by Patricia Pizarro to thanks all those people who had been involved in the Stirling Chilean Solidarity Campaign in the 1970s. Among her guests was the former Labour MP Dennis Canavan who had had an active role in the Campaign in this area. 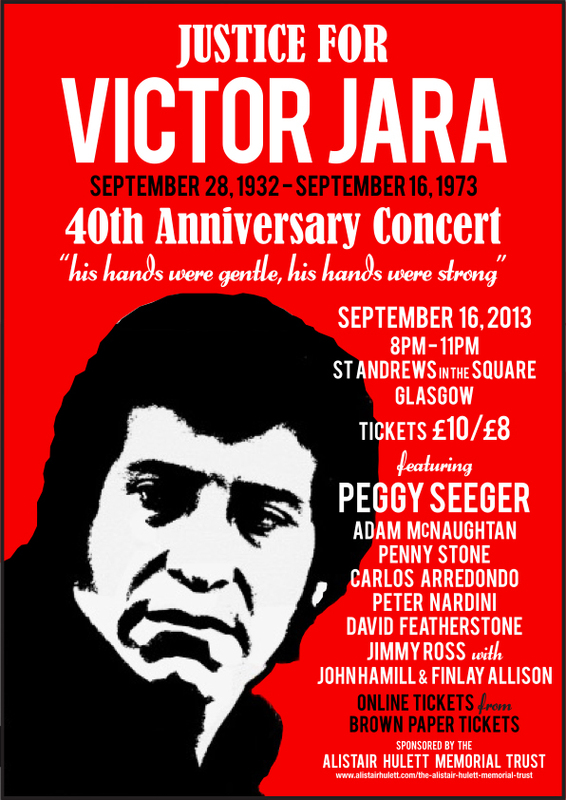 We were also invited to Glasgow to appear in the concert ‘Justice for Victor Jara’ organised by the Alistair Hulett Memorial Trust. We appear alongside some Scottish musicians and Peggy Seeger. 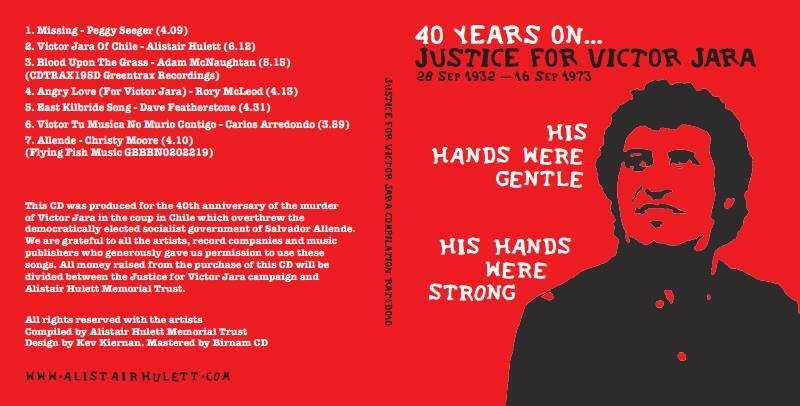 I was also asked to contribute with my song Victor tu Música no Murió Contigo to the album 40 years On Justice for Victor Jara, with the involvement of well known Scottish folk singers, produced by the Alistair Hullet Memorial Trust. 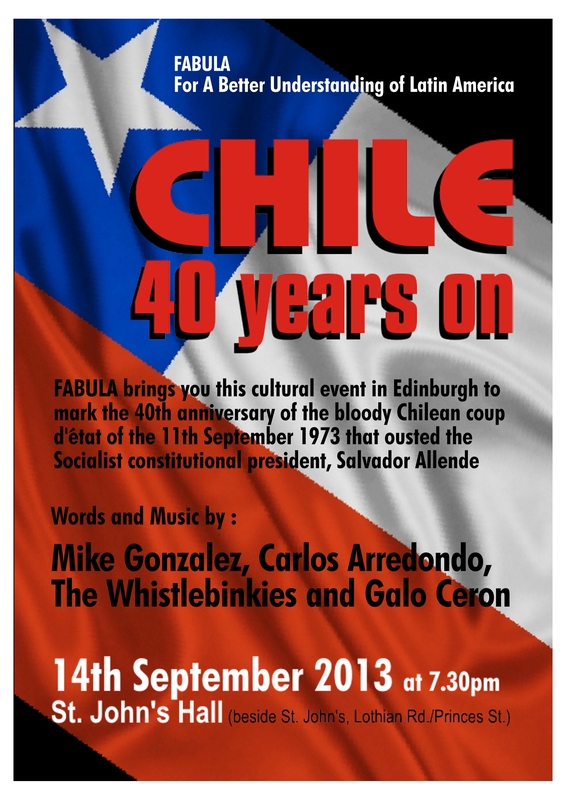 The Edinburgh and Glasgow Socialist Workers Party (SWP) branch invited us to participate in two commemorations events of Chile Forty Years On. 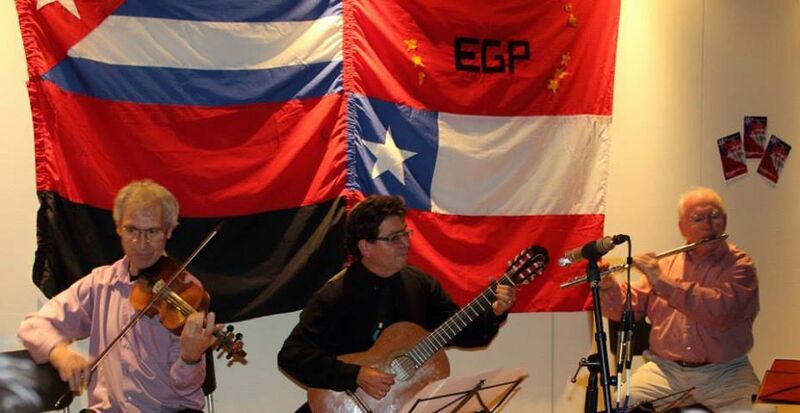 Fiona and Iona invited us to give a talk about Chile to their university students and play some music of the period. I was requested by The Cinema club, Edinburgh to present the Chilean film ‘NO’.It was very well attended. I gave interviews for The Scotsman, BBC radio Scotland, and The International Business Times of New York. I was also asked to write for a Student magazine in La Serena in Chile and a short piece for the Edinburgh Peace and Justice Centre magazine. There were many expenses incurred in most activities and were all covered by the donation received at the concert: £ 491.00. After paying costs, FABULA were left with £200.00 which along with a £400.00 donations given to FABULA by Miss Ada Pagan were sent to Chile to help two fishermen from he area of Tumbes. Below: Concert with the particpation of the Glasgow Folk Band The Whistlebinkies and its musical director, the composer Eddie Mcguire. They have been involved with solidarity with Chile since 1974. Mike Gonzalez ( a speaker) a very important member of the Chile Solidarity Campaign in Glasgow 1974. 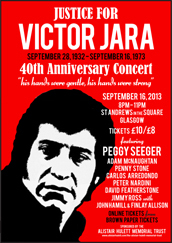 Below: the concert ‘Justice for Victor Jara. 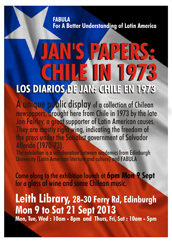 At Leith Library, ‘Jan’s Papers – Chile in 1973’.